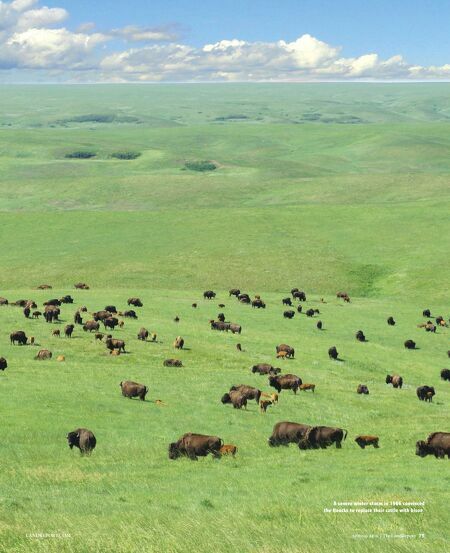 W hat began as a novelty for the Houcks — running a few bison — eventually became a herd of 3,500 head. The impetus was a severe winter storm in 1966. An Arctic front blew down over the Great Plains. Snow began to accu- mulate. Drifts piled high. They grew so tall that the Houcks couldn't get out of the house to feed their cattle or search for strays. When they were finally able to make their way out of the house and into the fields, they were shocked to see bison running and playing in the snow. It was a eureka moment. The Houck's herd of bison grew from tens to hundreds and then thousands. So did the ranch's renown. In 1989, the South Dakota Department of Tourism contacted the Houcks about a production company that wanted to use the ranch as a movie set. Few in Hollywood suspected that Kevin Costner's epic Western Dances with Wolves would eclipse films such as Pretty Woman and The Hunt for Red October at the box office and gross more than $400 million worldwide. In addition to serving as the setting for the dramatic buffalo hunts pre- sented in the film, the ranch also was the site of Fort Sedgewick, the remote outpost where Costner's character, Lieutenant John Dunbar, was assigned. Nominated for 12 Academy Awards in 1991, Dances with Wolves won 7, including the most important of all, Best Picture. The film's cinematographer, Dean Semler, did a masterful job of incorporating the ranch's open range, deep breaks, and rambling creeks to superb effect. Semler's eye for the land won him an Oscar too. 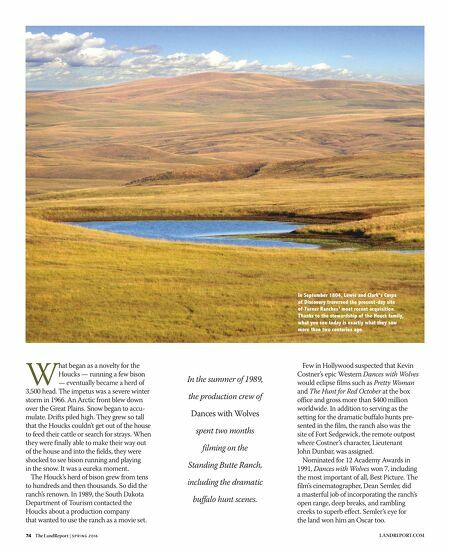 74 The LandReport | S P R I N G 2 0 1 6 LANDREPORT.COM In the summer of 1989, the production crew of Dances with Wolves spent two months filming on the Standing Butte Ranch, including the dramatic buffalo hunt scenes. In September 1804, Lewis and Clark's Corps of Discovery traversed the present-day site of Turner Ranches' most recent acquisition. Thanks to the stewardship of the Houck family, what you see today is exactly what they saw more than two centuries ago.